Kota has a versatile history, but what is constant are the battles fought for its possession. Kota’s early history is cloaked in valour-in fact, its very existence owes to a battle hardened 14 year old Rajput called Rao Madho Singh, the son of Rao Ratan, the ruler of Bundi. The history of Kota is linked with the history of Bundi. Both Bundi and Kota came under the rule of the Chauhans in the 12th century. The descendents of the Chauhans set up their capital at Bundi. While Bundi was the capital, Kota formed the land granted to the eldest son of the ruler. Emperor Jahangir, the great Mughal ruler, partitioned Bundi and made Kota an independent state. Rao Madho Singh, son of the ruler of Bundi, ascended the throne of Kota. It became a part of the British Empire in 1818 and later became a part of the Indian state of Rajasthan, when it gained independence in 1947. Kota is a beautiful town in Rajasthan, full of gaiety, cheer and steeped in colorful history. 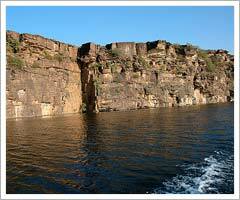 Located on the eastern bank of the Chambal River, Kota is well known for its ancient palaces, havelis or mansions and castles. The city is a modern settlement now and is known for its natural and man made marvels. Though Kota boasts of a small airport, the main international airport at Jaipur (240 km) connects it to the rest of the world through regular flight services. Dussehera is one of the prime festivals of Rajasthan and is celebrated with great pomp and grandeur in Kota.